Individuals vary in their phenotypic traits. The importance of this truism has long been recognized in the field of evolutionary biology; without such heritable variation, there would be no evolution, as Darwin rightly pointed out. In contrast, the study of ecology seems to have often blipped along merrily, while quietly sweeping variation within species under the rug. Perhaps it wasn’t naively that ecologists regarded all individuals within a species as identical when constructing models of species competition, predation, etc. but simply from a need to reduce complexity. When I began my MSc degree, back in 2006, the potential importance of individual variation for ecological dynamics was finally receiving some long-deserved attention. At that point in time, we had a collection of rigorous studies showing effects of genetic diversity on population, community and even ecosystem variables – everything from primary productivity, to nutrient cycling, to community resilience and species composition might be affected. However, this result was by no means universal – and studies that did find positive genetic diversity effects also varied in the magnitude of the effects identified. Clearly, we knew that genetic diversity could be important to ecology, but we had little predictive understanding of these effects. What mechanisms generate diversity effects? How does environmental context matter? Why does genetic diversity produce effects in some studies but not others? These are the kinds of questions that my MSc supervisor, Dr. Mark Vellend, and I pondered. We were particularly intrigued by the circumstantial evidence from studies of marine eelgrass (i.e. Reusch et al. 2005. PNAS 102:2836-2831, Hughes & Stachowicz 2004. PNAS 101:8998-9002) that genetic diversity effects might only be revealed under poor conditions (e.g. stress or disturbance). Mark and I wondered if this might be a general result – did diversity matter more under unfavorable conditions, which might magnify genetic differences among individuals? We designed an experiment using locally collected (on the British Columbia coast), asexual dandelions to investigate this possibility. In the spring of 2007, we created replicate dandelion populations of low (1-genotype), medium (2 genotypes) or high (4-5 genotypes) genotypic richness under field conditions. 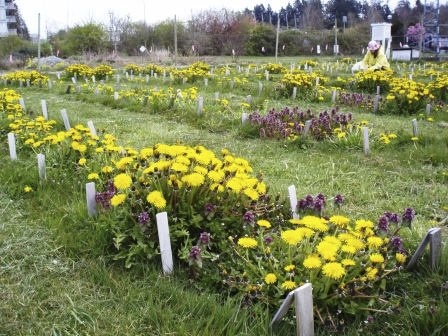 This diversity treatment was fully crossed with an environmental treatment: dandelions grew in either unfavorable “mowed lawns”, or in recently tilled, favorable “fallow fields”. As you can see from the pictures, these habitat types were completely randomized across the plots (we created the fallow plots as needed, by turning over the sod) and the initial growth environment varied hugely depending on habitat. In contrast to the fallow field, plants in the mowed lawn were surrounded by other species and regularly disturbed by clipping. Planting the dandelions in a grid pattern in each plot, we were able to assess seed number and total leaf area (a measure of plant size/biomass) for each individual over the course of two years. We found that genotypic diversity enhanced population performance universally, but to a greater degree in the fallow field. For example, the gain in plot performance with diversity, from low- to high-richness plots, was 52% vs. 20% for leaf area and 31% vs. 23% for seed number. Large genotypes dominated in the fallow field leading to positive selection effects and significant overyielding. In the mowed lawn, where performance was limited, there was evidence for complementarity among genotypes, but no overyielding. Hence, our diversity effects, while clearly environment-dependent, were stronger in the more favorable environment - contrary to our prediction. While we don’t have a precise explanation for this result, our conjecture is that the larger size of and the stronger competition among genotypes in our fallow field enhanced genotypic differences. There is some evidence for this in the data. Unfortunately the capacity of dandelions to form multiple rosettes, all attached to the same taproot, eventually led to difficulties identifying “individuals”. After about 2 years, despite our handy grid system, the plants had become so large that figuring out who was who in our experimental plots became next to impossible. While this meant that we could no longer determine the underlying mechanisms, which requires data on individuals, we could still examine the plot-level diversity effects. When we terminated the experiment in the summer of 2010, genotypic diversity effects were still strong and present. In fact, these effects increased in strength with time – just as has been found for species diversity effects on productivity! A complementary field seed germination trial we carried out in 2008 revealed that differences in performance (i.e. seed production) among genotypes in different treatments should carry over into the next generation. Hence, genotypic diversity effects may be more than merely transient dynamics, and could have long-term ecological consequences in our system. As I’ve also discussed, these effects were sensitive to environmental-context, possibly relating to the frequency of disturbance and strength of intraspecific competition. While it remains possible (and likely) that genetic diversity may have strong population-level consequences only under stress or disturbance in some systems, our study suggests another set of circumstances that might reveal important diversity effects: dense, monospecific stands of a focal species, with intense competition among individuals. To learn more, you can read our paper in PLoS ONE: http://dx.plos.org/10.1371/journal.pone.0030314. IS that bit at the end about seed counts a lamarkian sort of inheritance or just selective pressures acting quickly? I could see smaller seeds having some permanent impact on the plants that grow out of them but can't quite decide if that's what was being described. Our paper explains the seed germination trials in much greater detail, for your reference. In brief, we observed differences in average seed production (a measure of fitness) between genotypes in our different treatments. Looking at Fig 4 in our paper, for example, genotypes 2 and 9 have higher seed production than the other genotypes in the Fallow Field, and they produce even more seeds in mixture than in monoculture. We wondered if this meant they would also leave more descendants in the next generation. Even if a genotype produces more seeds than another, this does not necessarily translate into more offspring if the seeds are of lower quality (and e.g. 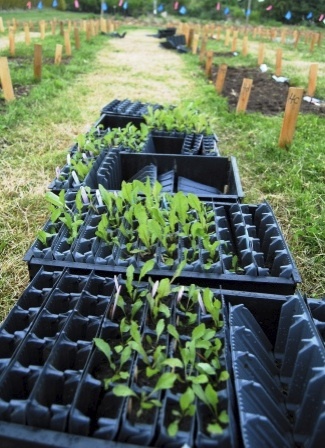 fewer germinate or survive). 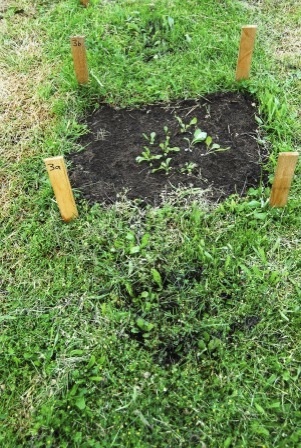 Our germination trials (where we planted seeds of each genotype in both environments) revealed no differences in germination success among genotypes in the Mowed Lawn. Hence, more seeds should equal more descendants. In the Fallow Field, genotypes that produced more seeds also tended to have higher germination success - here, differences in seed number should be exaggerated in the number of descendants. This all means that a specific dandelion genotype, depending on its local environment (both who its neighbours are as well as the habitat type), will have a higher or lower fitness. Does this make sense? Did you investigate the role of apomixis in any of the effects seen? We only used apomictic, triploid dandelions in this study, with the genotypes collected locally in Vancouver, British Columbia. There are however sexual, diploid dandelions in the native range in Eurasia. But for our purposes, manipulating the number of clonal genotypes, or "genotypic richness", was the only practical way to do this study. The use of clonal species is almost universal in ecological studies of genetic diversity of this sort, owing to logistics. It is an interesting question as to what would be found if we were able to use sexual species, for example creating diversity treatments based on genetic variances, or some other more direct measure of diversity. You can check out Hughes et al. 2008 (Ecol Lett 11:609-623) for a discussion of this issue. Clearly more research is needed in this area. I hope that answers your question; I wasn't quite sure if that's what you meant by "the role of apomixis".